Skye locks onto and reveals the target she most recently basic attacked. Basic attacks and Forward Barrage on that locked target grant her bonus move speed. This speed bonus is dramatically reduced while moving backward. Target Lock is lost if the target moves too far away from Skye or if she doesn’t attack her target for too long. 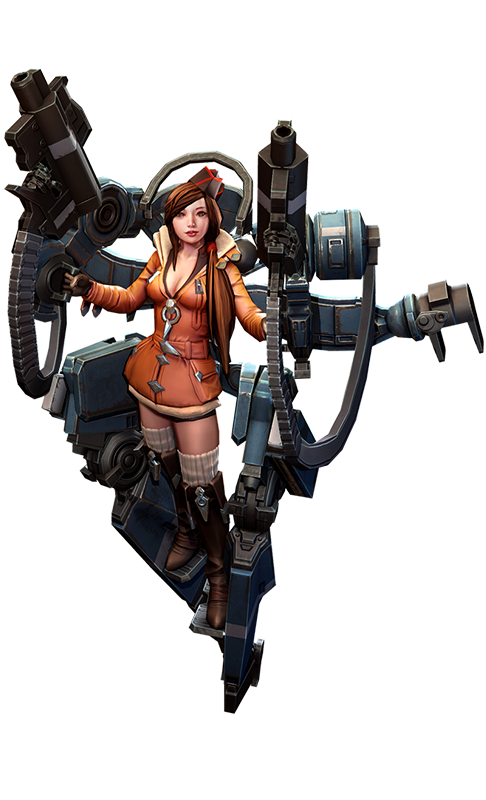 Skye fires her guns while strafing. (She can move freely but cannot change her facing direction.) Reactivating this ability will cancel it. Forward Barrage deals damage to her locked target (but less damage to non-heroes). The duration increases with Skye’s crystal power up to a max. Passive: Each ability point in Suri Strike increases the amount of time Skye can keep her target locked without attacking it. Active: Skye dashes to a chosen location near her locked target. While dashing, she fires a volley of missiles that lead her target. This ability can only be activated when Skye has a locked target. Passive: Each ability point in Death from Above increases Skye’s target-lock range. Active: Skye fires a salvo of missiles at a chosen location near her locked target. After a brief delay, the missiles rain down on that location, stunning enemies. Enemies still in the area afterward are slowed and take crystal damage. Aiming directly on your locked target rains down the missiles in a cluster. Aiming away from your locked target rains them down in a line across the target’s path. 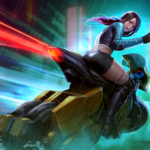 This ability can only be activated when Skye has a locked target. Skye stepped forward, trying to catch Baron’s eye, as his mother reached toward the tile table. There was only one astonished gasp in the crowd when Nari’s tile was plucked up. Baron’s eyes did not waver from his newly chosen bride-to-be. Skye’s own tile was still encased inside Baron’s fist, to be chosen that night by no one. Realization gathered like rocks in her throat. I will need you to be my general. Skye dissolved backward into the crowd, then sprinted out the door and down the hill alone, into the deep night, yanking the rings from her hair. She ran to run, something primal within her chest demanding escape. At the giant rolling door of the hangar she stopped, her hair wild around her face. Another girl might have gone home to weep into her mother’s arms, but Skye had always felt more at home in the garage with her father, fixing things or, when she was little, breaking them. It felt good … No. Nothing felt good, but it felt right to get out of the hanbok, to tie her hair up the way she liked it, to rub off the makeup. The familiar grease and gunpowder smell of her jacket soothed her. She climbed up into the mech she’d reappropriated to figure out how she’d ever show her face among the other pilots. How she’d apologize to umma for running out like a minion on fire. But she could only think about what Baron had said. There are times I wish that the mines would disappear. In the quiet, dark hangar, encased in the machine, Skye heard his voice as if he were still close by. “The choice would be ours,” whispered Skye. Baron no longer had a choice, but there was a way she could choose for him. She powered up the mech, pulled on her gloves, and gripped the handles. Before anyone could stop her, before she thought long enough to stop herself, she walked the mech outside. Despite the humiliation of the night, despite the gravity of what she was going to do, driving the lighter mech was a thrill. So agile, so fast. She avoided the main gate — unauthorized use of a mech was still a crime, general’s daughter or no — and tip-toed the mech through the minion camp. The beasts slept in haphazard piles, their snores warbling; they were known for brute toughness and obeying orders, not thinking fast, so they gave her no trouble. She shot over the security gate, zig-zagged through a mandarin orchard, hovered over rice paddies and cabbage fields. Here and there laid the rusted and broken remains of rice transplanters and plows, the first machines that had evolved into blasthole drills and frontloaders when Baron’s ancestors had struck silver. When they’d hit crystal, and the other houses discovered the power of the halcyon within the crystals, the mining machines had been repurposed for war. Farmland gave way to trampled dead battleground, brown with bloody mud. The mech glided over coiled barbed wire and then landed, strong as an eagle perching, on the reinforced wall. Ball-shaped security bots buzzed around her, scanning the mech code, then her retinas. With a squeeze of the trigger, Skye strafed to the left and fired. One by one, the bots burst apart and fell, crackling, to the mud. Staring down into the glowing blue, she flicked a switch to arm the missiles. “Okay.” She patted an autocannon. “Let’s end this war.” The jet nozzles activated. The mech rose, then hovered over the mine. The first missile shot deep inside. The explosion rocked the ground and blasted out millions of tiny crystal shards. Skye ducked behind her arms as the shards pinned themselves into her jacket, poked her legs. There was no time to lose. She had to complete her mission before anyone could stop her. 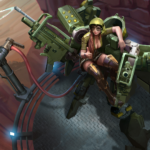 She strafed and fired, let loose salvo after salvo of missiles, rained death from above into the mines, destroying the crystals that had powered a civilization for generations. The halcyon power that so many had fought and died to possess bloomed into the night sky, then dispersed into the night air. Skye strafed her way through the dense crowd of nervous girls surrounding the choosing table where the silver tiles laid, each engraved with a name. The marriageable young men crowded in corners playing Yunnori and howling at the results, seeming to care little for the outcome of the Choosing, but the young ladies ran their fingers over their own names and gossipped about which girl the house mothers would choose for their sons in the ceremony. Skye closed one eye and targeted the smug first daughter of Tiger House, a pretty girl named Nari. Around one delicate wrist, Nari held the velvet leash of a drugged and declawed tiger that blinked with confusion at the guests. A finger jabbing into her spine straightened Skye’s posture. Her mother had shadowed her all night, correcting with bruising pokes and hissed instructions. Skye plastered a disingenuous monster of a smile on her face and neglected to answer, choosing instead to hold Nari’s lazy gaze until the high-born girl looked away. “I need air,” Skye said to no one in particular. She hid two honey pastries in the sleeve of her overcoat on her way outside to the dark balcony. In the far distance, down the great hill upon which the Silver House stood, past the outlying village, past the farmland and minion camps, the crystal mines glowed a calm, eerie blue in the night sky. She stuffed a pastry whole in her mouth. Baron stepped close behind her, his words tickling the skin on her neck. He plucked the other pastry from her hand and popped it into his mouth. He wore the silver-embroidered robes of his house and his knuckles were crowded with silver rings. He wore his wealth as was fitting; after all, it was his great-grandfather’s mining that had unearthed the powerful crystal. Other houses had vied for it, battled for it and died for it, but Silver House had held it. Skye could not look at his eyes. She stared instead at his hands, at the scars from fighting that crosshaired his knuckles. “My father is collecting information about powerful energy wells where crystals may be recharged,” she offered, but Baron shook his head. “The choice would be ours,” whispered Skye. She covered Baron’s hand with one of hers and jolted with the electricity of it. “You aren’t supposed to be here today.” The general’s long shadow stretched into the hangar from the rolled-up garage door. “Umma, what are you doing here?” Skye whined, slumping in the cockpit. “Your name will be chosen from the tiles tonight. Get out of that thing.” Skye’s mother stood next to her husband at a stern parade rest. “I don’t want to be chosen. There’s a war happening.” But Skye obeyed, climbing down to join the crowd, casting a betrayed glance at her father. “I’m a pilot, Appa. And I’m the best pilot you’ve… ow!” She winced as the makeup bot attacked her eyebrows with tweezers. The manicurist sat on a stool beside her and clucked under her breath at the broken nails and calluses. The hairstylist pulled Skye’s hair out of its knot and yanked through the tangles with a comb. Skye went still. “She … she would never choose me. There are many highborn girls in the tiles this year.” The hairstylist stood on a stool behind her and pulled Skye’s hair into braids, weaving in the rings. “The politics of the choosing are complex. A choice for the general’s daughter would send a message,” replied her mother. “It would be an overt act of war not to join Baron with one of the marriageable girls of Silk or Tiger House.” The general’s brow wrinkled with worry. “If it is war they want, my new mech design will win it.” Skye’s flight jacket was removed, and the dress draped around her. The dressmakers knelt, pins sticking out from their mouths, to correct the hem.